Conservation science has long been seen as the domain of trained professional. At CC, we have long acknowledged the role of indigenous knowledge, and published a special issue on the topic in 2013. We engage with this issue by visiting a fascinating project in the Nilgiris, a collaboration between Keystone Foundation, a local NGO and Cornell University, USA. Steven Wolf et al. provide an overview of the project which attempts to integrate research and practice towards conservation and sustainable development. Their article is linked to seven research pieces (online only) written by seven pairs of student researchers including an undergraduate student from Cornell and a young Adivasi community member from the Nilgiris. 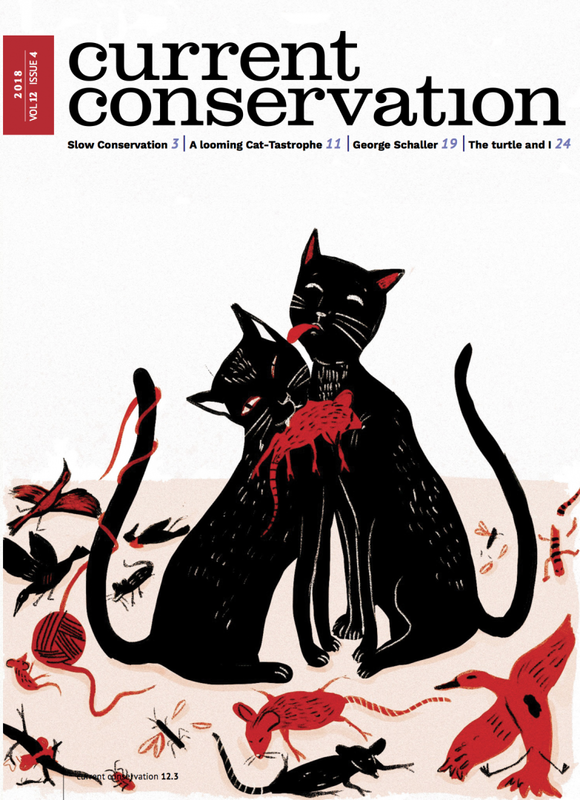 Our feature article in this issue takes on the contentious issue of cats. Not so much differences in musical tastes pertaining to Andrew Lloyd Weber’s rendition of TS Elliot’s poems, but the dramatic impact that domestic cats have on biodiversity, and the opposition from cat fanatics to doing anything about it. We include an interview with George Schaller, one of the pioneers of wildlife biology and conservation. Talia Tamson gives us a glimpse into the use of cameras to study whale sharks. And in our creative rambling section, we have a poem delving into a researcher’s tryst with turtles; and our columnists wonder what the Half-Earth movement might look like if it were an Avengers movie!